BUDDS CREEK, Md. 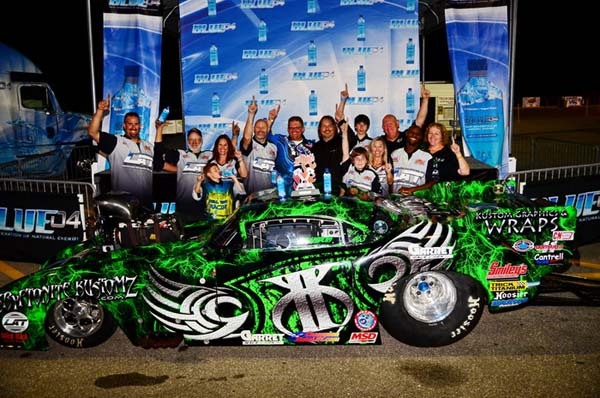 -- After a rain out for the finals of the Pro X-Treme class from the X-Treme Gateway Showdown, Pesz and Tindle finally met for their showdown under the lights. At the X-Treme Gateway Showdown, contested on June 15-16 at Gateway Motorsports Park, Brandon Pesz thrilled the crowd with a 3.628 at 208.91 mph in qualifying. During the semi-final round, Pesz defeated Quain Stott going 3.690 at 204.91 mph while Tindle defeated Todd Tutterow by going 3.696 at 204.57 mph. As the temperatures cooled, fans hoped these drivers would challenge Pesz's 3.628 but the rain moved in too quickly to complete the final. Brandon Pesz and crew celebrate win. 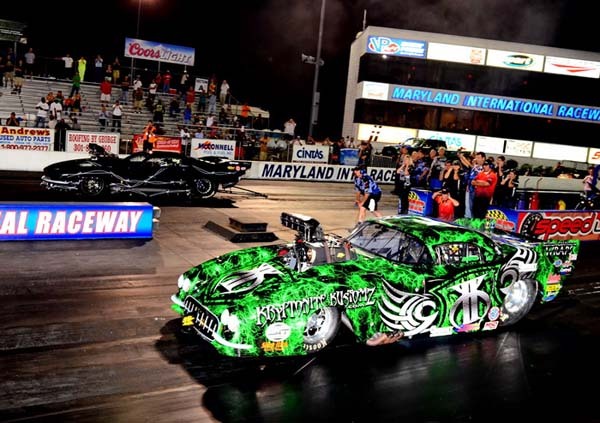 Going into the weather-delayed final at Maryland International Raceway, neither Tindle nor Pesz had completed a clean pass in the first or second round of qualifying, but weather conditions continued to improve for the third round of qualifying. The crowd cheered the pair on in anticipation of a 3.50's run, and were nearly rewarded when Pro X-Treme points leader Brandon Pesz ran a 3.609, at 208.78 mph defeating Tindle for the X-Treme Gateway Showdown trophy. The pair will meet again Saturday, July 26 for the final round of qualifying and eliminations for the Mayhem at the Creek.